Anthem: "O Land of Beauty!" Ryal anthem: "God Save the Queen"
Or "Federation of Saint Kitts and Nevis". The Federation o Saunt Kitts an Nevis (Inglis: Federation of Saint Kitts and Nevis) locatit in the Leeward Islands, is a federal twa-island naition in the Wast Indies. It is the smawest sovereign state in the Americas, in baith aurie an population. The caipital ceety an heidquarters o govrenment for the federatit state is Basseterre on the lairger island o Saint Kitts. The smawer state o Nevis lees aboot 2 miles (3 km) sootheast o Saint Kitts, athort a shallae channel cried "The Narraes". Historically, the Breetish dependency o Anguilla wis a pairt o this union an aw, which wis then kent collectively as Saunt Christopher-Nevis-Anguilla. 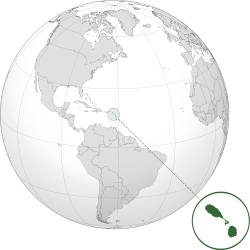 Saunt Kitts an Nevis are geographically pairt o the Leeward Islands. Tae the north-northwast lee the islands o Sint Eustatius, Saba, Saint Barthélemy, Saint-Martin/Sint Maarten an Anguilla. Tae the east an northeast are Antigua an Barbuda, an tae the sootheast is the smaw uninhabited island of Redonda, an the island of Montserrat, which currently haes an active volcano (see Soufrière Hills). Saunt Kitts an Nevis wur amang the first islands in the Caribbean tae be settled bi Europeans. Saunt Kitts wis hame tae the first Inglis an French colonies in the Caribbean, an sicweys haes an aw been titled "The Mither Colony o the Wast Indies". ↑ 1.0 1.1 1.2 1.3 "St. Kitts and Nevis". International Monetary Fund. 2016. Retrieved 1 April 2016. ↑ "2016 Human Development Report" (PDF). United Nations Development Programme. 2016. Retrieved 23 March 2017. This page wis last eeditit on 15 Februar 2018, at 21:14.